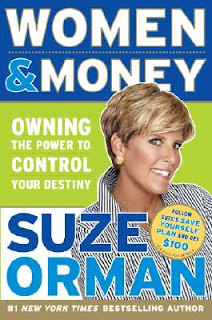 Women and Money by Suze Orman...The Most Important Book You Will Buy This Year. Period. The million-copy bestseller is finally in paperback! Okay...yeah, the pitch is the typical cheesy pitch from most personal finance books, but I love Suze Orman's Women and Money. I don't care if you are a working single woman or a stay-at-home mom: get this book. If you have to check it out from your local library or buy it with a gift card (as I did), just do it. I am a fairly successful woman. I have a professional job in an exciting field. I have a lot of knowledge about a lot of things. But one area of my life that caused constant confusion is my financial life. Sure, I know how to balance a checkbook and pay my bills. I understand the basics about credit and FICO scores. But my biggest hurdle has been trying to understand retirement, investing, and planning for my senior years. I have tried to make good decisions all along, but I never really understood completely everything that I was signing or investing in when I started a new job. And I think it is a big mistake to trust someone unquestioningly with my money. I wouldn't just hand my kid (if I had one) over to a stranger...so why do that with my money? I'm not saying that I am suddenly getting super involved and becoming a stock broker. Not at all. I just want to know how to read my retirement reports and when to say no or change things around. So, that is the main reason I picked up this book. Let's face it: I am 36 and single. Chances are, I will be 76 and single. I'm not complaining. I am totally cool with that (and prefer it). I'm not saying I would never marry, but I don't really see it happening. That being said, I need to make sure I am taken care of when I get older. I have people in my life who I can trust to help handle things, but I need things (i.e. money) for them to handle. AND, if I were to marry, this opens a whole new can of worms, right? You suddenly become a "we," and then, as a woman, you have to be super careful about your assets and financial life. I am a big believer in protecting yourself. There is nothing horrible about prenuptial agreements. There is nothing wrong with saving just for you, should something happen to your husband. Let's face it: divorce is rampant. You need to protect yourself. And this book explains why and how. Orman lays everything out in a five month process, beginning in month one with explaining the basics about which checking and savings accounts you should set up, how much you need to have in there, etc. The next chapter is about credit and FICO scores. All pretty basic, but that is why I love this book. There are so many women out there who have no idea how all of this works--and they MUST learn. I have watched too many women get into financial trouble after a divorce or when their husband died. I can't tell you how many friends and relatives have said, "Well, he handled all of that." NO. YOU NEED TO LEARN HOW TO HANDLE ALL OF THAT. The remaining chapters explore retirement investing, wills and trusts (very interesting), and other important points. Her explanation of retirement plans was so helpful to me. I feel so much better now about what I am looking at when I get my statement. And knowledge is power. In fact, empowerment is the core of this book. All women need to realize that they should take care of themselves financially. I was reading the first few pages of the book when something Orman said made a light bulb go on for me. She said to stop putting myself "on sale." In other words, women tend to do a lot of things for free and get little to no monetary reward. It is true. I have made money for so many people around me throughout my life. There have been countless times when I have settled for less (many times for MUCH LESS) than what I am worth (and what my time is worth). So, I am no longer on the discount aisle. :) This doesn't mean that I am materialistic. I am just interested in self preservation and independence. I especially love the attention Orman pays to stay-at-home moms, some of the most financially vulnerable people out there. I love stay-at-home moms (I've talked about this before on this blog), but it is absolutely true that you need to have your own savings account and retirement assets. Orman explains why in her book, and her reasoning is absolutely true. I can give you a personal example, also: A friend of mine's sister-in-law recently lost her husband to a sudden heart attack. She has two boys, 13 and 15. She has never worked. Her husband had no life insurance. She has NOTHING. Literally. Luckily, her church is paying three months of her house payment, but that isn't long. And for someone who has never worked and who has no emergency fund set up (and we all need one, even if your spouse or partner has made arrangements to provide for you...READ THE CHAPTER ON WILLS. It takes way too long and by the time it is over, well, the courts have your money), well, she is in bad shape. Her job prospects aren't wonderful at this point. Can she make it? Sure. She can absolutely do it. But her path is going to be so much more difficult because of some things she and her husband should have done. I have seen some people criticize this book because it is "too basic." If you already know what she is saying, wonderful. But this book is written for the majority of women out there who are confused about finances in some way, shape, or form. Like Orman says, there is "no shame" in being uninformed and "we can't change our past." But you can take control of the future. There is no excuse not to. If you have to rationalize that you are doing it for your kids, then do so. Because the last thing you want is for them to be burdened with your upkeep. Things are hard enough as it is. So, get this book!! I can't stress it enough, ladies. I have to say Suze has a way of simplying financial matters to us readers.